Enter GoGo squeeZ Applesauce, which I first tried at the Natural Foods Expo (NPE) in Boston a few months back. 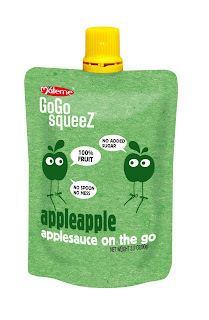 GoGo squeeZ is the first squeezable, re-sealable, no-mess applesauce packaged in a squeezable pouch and equipped with a re-sealable lid. Originally designed for NASA astronauts, each all-natural pouch also contains a full serving of fruit. During this holiday season, I make sure my refrigerator is stocked with these tasty and delicious pouches. GoGo Squeeze comes in 5 flavors – appleapple, applestrawberry, applepeach, applecinnamon, and applebanana. Being an apple sauce traditionalist, my favorite is the appleapple flavor – but the applestrawberry flavor is pretty good too – it’s my sister’s favorite. Contest ends January 4, 2010 at 5pm EST. Winners will be chosen via random integer generator on random.org announced on the financefoodie.com site shortly afterwards that night! I snack on whatever looks good at Starbucks! I like snacking on pita chips. I usually bring grapes or a granola bar to snack on. I snack on trail mix when I'm running around doing shopping,. I always like to have a hot chocolate with me to get me in the holiday spirit! I like to keep a Clif or Larabar mini-bar in my purse for when a snack craving hits, and a piece of dark chocolate! I snack on food from whatever restaurant is near where I am shopping. I snack on granola while shopping. I follow GoGo squeeZ on twitter. I usually snack on granola bards when I am shopping! We snack on Rice Cakes. If I'm out shopping alone I'm usually snacking on something unhealthy like a candy bar but when my children are with me we bring raisins or cereal baggies. I'm following Finance Foodie on Twitter user lisalmg. I'm also following GoGo squeeZ on Twitter user lisalmg. During the holidays (or whenever) I always pack some pretzels. I also started bringing a small insulated bag with carrots, celery sticks, apples and bananas. Usually some type of chocolate - kisses or the like. I usually eat a candy bar when I'm out shopping. I follow GoGoSqueez on twitter - ncschools. I follow Finance Foodie on twitter - ncschools. I snack on anything my son is snacking on..usually Goldfish! I snack on milkshakes during my holiday shopping trips. We always stop and get milkshakes from Steak N Shake! I snack on homemade Chex mix. Abything that is quick like a banana or yogurt. during holiday shopping trips I generally snack on some kind of fruit smoothie purchased in the food court. I follow Finance Foodie on twitter. I'm sjdioguardi. I follow GoGo Squeez on twitter. I'm sjdioguardi. I snack on m&ms when shopping, if anything. I like to stop in at Target or the Mall and get a pretzel. Thank you for having this giveaway. I Follow Finance Foodie on twitter as litefoot873. I Follow GoGo squeeZ on Twitter as litefoot873.